According to Lincoln Police, the Nebraska GOP headquarters in Lincoln was vandalized overnight Tuesday. A paper delivery person contacted police just before 3:15 a.m. Tuesday morning, saying the windows of the headquarters had been smashed by a brick. When police arrived, they found the windows broken and words "abolish ICE" on the sidewalk in front of the building. "The Vandalism of the @NEGOP headquarters by open borders activists is completely unacceptable," the campaign account for Gov. Pete Ricketts tweeted. "Nebraska Democrats must address the call to lawlessness in their party." The Nebraska GOP also tweeted accusing the Democrats radical rhetoric incites violence. Officials from the state's Democratic Party tweeted a response just before noon on Tuesday: “We understand how frightening it is right now to be working in politics where people are resorting to violence, racism, and other divisive rhetoric. Our workplaces and homes are meant to be safe places where we pursue our goals and dreams. 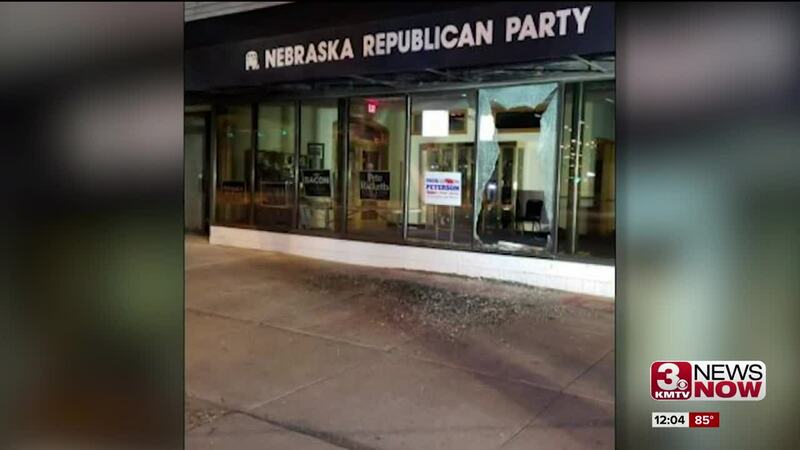 We condemn the violence and vandalism that happened at the Nebraska Republican Party. We want to remind citizens it is our duty to each other and to our country to debate, stand up for issues and to help people. We never stand for violence," Chair Jane Kleeb said in the statement published online. Bliemeister said, "The Lincoln Police Department is investigating the vandalism that occurred at the Nebraska Republican Party office. Every criminal investigation deserves our best efforts and this incident is no different. Officers canvassed the area for witnesses, processed the scene for evidence, and are collaborating with nearby businesses for video surveillance. Investigators are following up on all leads, including tips from citizens. As with any incident, the Lincoln Police Department is responsible for serving victims of crimes, conducting follow-up investigations, and ultimately, resolving the case to the best of our law enforcement abilities. Anyone with information is encouraged to call the Lincoln Police Department at 402.441.6000 or Lincoln Crimestoppers at 402.475.3600." Beutler said, "An act of vandalism committed because of political disagreement is reprehensible and should never be tolerated. That’s why the vandalism that occurred at the Republican Party Headquarters should be condemned by all. It is insulting to suggest that Lincoln police officers would ever put politics above their job to protect and serve our community. Our Administration has consistently demonstrated that the safety of all residents is our top priority. J.L. Spray shouldn’t be exploiting this issue to further divide us, he should using (sic) it unite us behind the cause of political civility."